I created this stylized “bar” graph to show the total current status of 46 reservoirs in the state (it is updated daily and shows yesterday’s reservoir level). The figure represents the total of these reservoirs using the outline of the state as a “container” which can “filled up”. The blue is the current water level (in kaf or thousands (k) of acre feet (af) of water1Units: An acre-foot is the amount of water that can cover an acre of land (43,560 square feet or 4047 square meters) at a depth of 1 foot. This is equivalent to 43,560 cubic feet, 325,851 gallons, 1233 cubic meters, or 1.2 million liters. Crazy units.). The top of state represents the full capacity of all 46 reservoirs (~27 million af) and is colored brown until “filled”. The red line is the historical average level of the reservoirs at the same time of year (e.g. March 8th) between 1960 and 2010. Check out an animated version of this graph. 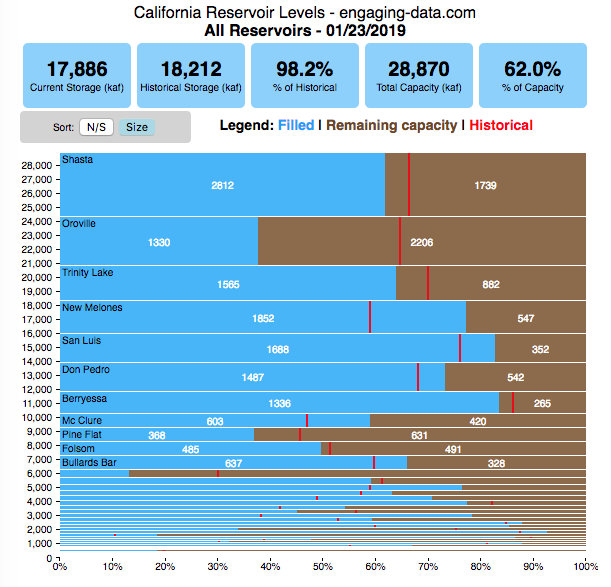 This second graph shows the historical storage levels of 46 of the largest reservoirs in California from 2009 until the present. The top 10 reservoirs are shown individually, while the remaining 35 are grouped together in the “Other” category2The names and codes of all 46 of the reservoirs I am tracking can be found on the California Department of Water Resources website – http://cdec.water.ca.gov/cgi-progs/reservoirs/RES. Hover your mouse over the graph to get data about specific reservoirs on a specific date (a popup on the cursor or on the legend). 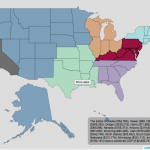 The total storage level can be compared to the historical average total reservoir storage levels. You can also zoom in to look at a specific time period via the scroll bar or by dragging the cursor between to dates. As you can see, 2010-2012 was a relatively wet period, while the last couple of years have seen reservoir levels well below the historical average. Spring of 2013 was the last time before this recent drought that reservoirs were at or above their historic levels. 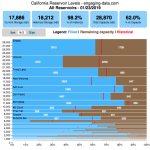 These graphs are created dynamically using data from the California Department of Water Resources (updated daily), so you can check this post occasionally to see how the precipitation are changing the levels of water in the state reservoirs. 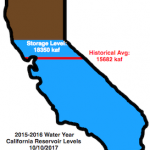 early March 2016: Current California reservoir levels are significantly below the historical average. The winter 2016 rains are certainly helping the cause, but it’ll take time for the reservoirs to fully recover. mid March 2016: The recent heavy winter rain storms have made a huge difference and the total reservoir storage is getting quite close to historical average. In fact, several reservoirs are near or above their historic average. late March 2016: The storage in the reservoirs has jumped up dramatically in the past few weeks. Many of the reservoirs in the North are close to their capacity and are letting out water in preparation for the snowmelt. 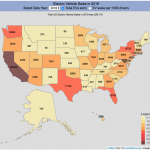 Reservoirs in the central and southern part of the state have less water. January 2017: The huge storm in California has finally pushed reservoir levels above their historical average for the first time since the spring of 2013 (almost 4 years). Unfortunately, all that rain has been accompanied by a bit of flooding in some areas. Hopefully, snow pack and reservoir levels will hopefully continue to improve. Summer 2018: The huge gains made in 2018 have mostly disappeared and reservoir levels are now back below historical levels again heading into the 2018-2019 water year. 1. ↑ Units: An acre-foot is the amount of water that can cover an acre of land (43,560 square feet or 4047 square meters) at a depth of 1 foot. This is equivalent to 43,560 cubic feet, 325,851 gallons, 1233 cubic meters, or 1.2 million liters. Crazy units. Nice work Chris! Your graphs are exactly what I had been trying to update for the last year. Thanks for taking that off my to-do list! I have a glitch in my python code that prevents it from updating. I’m still figuring it out, but I updated it manually so the data is mostly recent. I will try to get it updating daily again soon. As you progress the pattern after looking at over 100 years of well data California is at peak drought every 7 years or so.